Assuming no issues are encountered by testers I plan on submitting this version to the Apps For MeeGo repository, and later also the Nokia Ovi Store. You’ll need to restart your phone before statuses start appearing in the events feed, although you’ll be able to use the main app straight away. Because of some changes in the dbus services its also necessary to restart your phone even if you’ve already installed version 0.1 (this won’t be needed after future updates though). 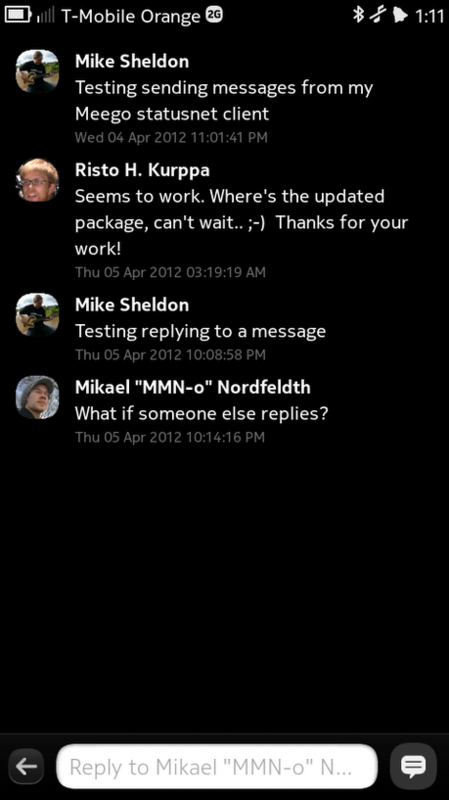 Viewing messages in the application. Load additional statuses from earlier in time. Asynchronous message loading and posting. Ability to mark statuses as being “favourites”. Option to subscribe to new users in the app. There’s one thing that my Nokia N950 has been lacking and that’s a StatusNet client, so I set about hacking one together. 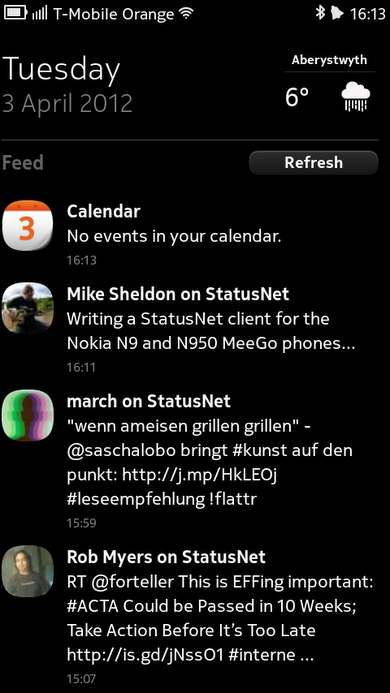 I love the way that the N9/N950 events feed displays messages from Twitter and Facebook, so my main focus so far has been to integrate with this. I’ve now got my client to a stage at which it covers most of my own needs so I thought I’d make an early release for others to play with. Once I’ve extended it a little further I plan on submitting it to both Apps For Meego and the general Nokia Ovi Store, but for now you can download the Debian package directly here. One thing to note is that you will need to restart your phone before events will start to appear (this is due to a limitation in the way the SyncFW framework loads plugins). The client is written mostly in Python, with a little C++ for integrating with the events synchronisation framework. It makes use of the StatusNet module written for the command line StatusNet client IdentiCurse and the python-eventfeed module written by Thomas Perl. * OAuth login for identi.ca. * Standard login for any other StatusNet services. * Shows messages in the events feed. * Fetches (and caches) user avatars. * Displays messages from the events feed in the browser when clicked. * Automatically fetches new messages in the events feed based on your events feed preferences. * Can manually fetch new messages via the events feed ‘Refresh’ button. * Displaying messages locally within the application.